In addition to "narujakkara" (rope chair), it was the only useful object that I had made at school. For the new kantele, which inherited the basic form of the old one, I did not take pictures of the building process (stupid me!) so I'll draw some diagrams instead. Kantele being a folk instrument means that you can make it your own, and you can use pretty much whatever materials you have available. I like to think that there's no wrong in the construction or playing of folk instruments. Kantele has no fingerboard so the dimensions are not critical. Woodworking tools: Saw, F-clamps, electric hand sander, a sharp knife, planer, and a high-speed rotary tool. Also a bench drill was used with the bits on the left. 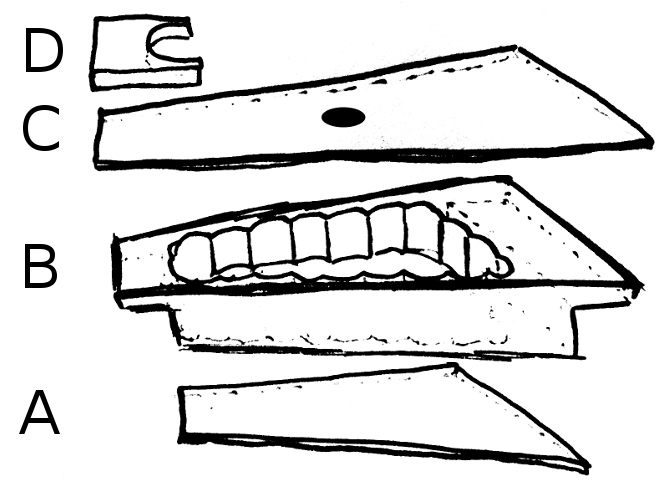 The four parts of the kantele: A) bottom, B) body, C) top, and D) ponsi. The parts pictured have not received a final shaping. For the body (B), I used a piece of 48 mm x 123 mm structural whitewood timber I found from the thrash. This was sawed to a rough shape and hollowed using a bench drill. At this point, correct any defects like branch holes (you can glue a wooden stop in place of a cracked branch). 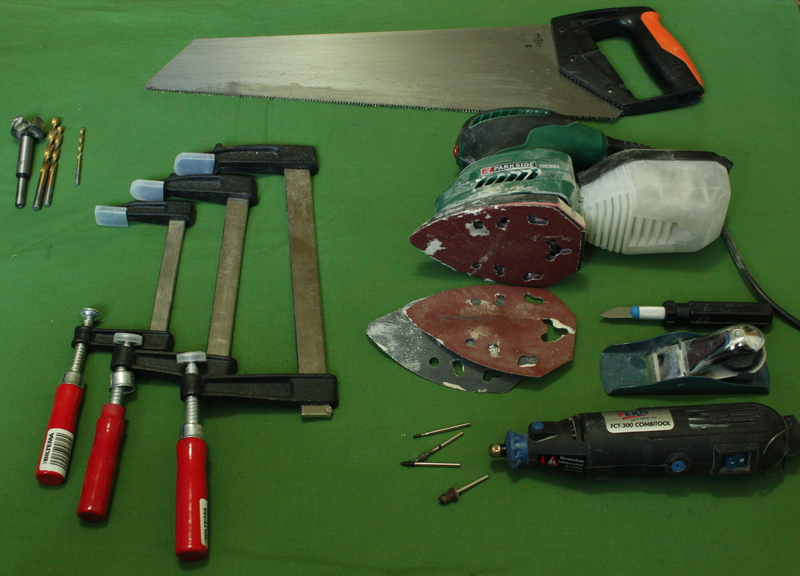 The insides were finished using a sharp knife and a hand-held sander with rough sandpaper. Make the body as thin as you dare, as also the sides will vibrate. You'll be surprised how light-weight the body is after it is ready; there's not much wood left in it. Cutting the body from 48 mm x 123 mm x 60 cm timber. First saw along the red lines, then along the blue lines. Finally hollow the body using a bench drill. The hollow goes all the way through because the top and bottom are added as separate parts. Smooth out any large irregularities from the inside with a knife and a hand-held sander. Make sure that the body is flat, by setting it on a flat table. If you see irregularities, you can use a planer to smooth them out. The planer doesn't bite too much and cause splintering if you always work the planer the same way as the grain rises. This way it doesn't follow the grain deeper into the wood. A good material for the top (C) and the bottom (A) is 3 mm thick 3-layer plywood. The material should not "eat" vibrations (like rubber or fiberboard) or be too heavy (like metal). Use especially for the top as thin a material as you dare. Using thinner materials improves the sound but makes the instrument more fragile. The bottom is not as critical as it will anyway rest against the legs of the player, or against a table/floor. I used two pieces of solid wood glued together for the bottom, as that was available to me. Use the unfinished body (B) to draw the shape of the top and the bottom on plywood (or whatever material you will be using). Make both 0.5 cm larger from all sides than the body so that there is some headroom for splintering during sawing of the plywood. Make a sound hole somewhere in the middle of the top (C). I used a high-speed rotary tool and abrasive bits to effectively burn the decorative sound hole, and used a sharp knife for finishing. To glue the top and the bottom in place, use wood glue and clamp the three pieces (A, B, and C) between two wooden boards (not too thick, say 1-2 cm). It is best to have at least 12 small-to-medium-sized bar clamps available. The protrusions at the ends of the kantele will need to be clamped separately as there is an air gap between the body and the bottom-side board. When the glue is dry, shape the piece using a hand-held planer and an electric sander with rough sandpaper. Don't use too rough sandpaper on the top and the bottom as it will take a lot of work to remove the scratches, and the plywood should be quite smooth to begin with. Be liberal in the way you work the piece, the shaping you do here will give your craftman's signature to the piece. To make the ponsi (D), you can use leftover wood from the body. When the shape of the kantele is almost finished except for the ponsi, you can draw the outline of the ponsi onto a piece of wood. Use your own judgement on the shape. The ponsi should be at least 1.5 cm thick where the metal bar (for attaching the strings) goes through it. I used a high-speed rotary tool with an abrasive bit to make the hole for the metal bar. Make sure the gluing surface is flat so that it mates well with the top (C), and glue the ponsi in place. Finish the shape of the kantele using gradually smoother sandpaper. Push a round metal bar into the ponsi. The rod should be strong enough that it doesn't bend from the tension of the strings. Instead of tuning pegs, I prefer geared machine heads intended for guitars. These are easier to adjust and you don't need to carry around a key with the kantele. Note that half of guitar machine heads tighten the string to the opposite direction, but it may be possible to modify them if you want the tuning direction to be the same for all strings. The string height should be 1 cm or more from the top surface. Distribute the strings pegs evenly, or if different strings are tightened to different directions make sure that the strings will be distributed evenly. Use a bench drill to make straight holes for the tuning pegs. Be careful when drilling, I damaged my kantele a bit at this step. Use gradually larger bits and hold down the kantele securely. Drill from top to bottom and have a piece of wood underneath the part you drill so that the wood of the kantele doesn't splinter when the bit comes out of it. When youre done, screw the machine heads in place. I left the paint work to be done by Dmitry and his wife. Some sort of coating is needed to avoid cumulative staining of the wood by touch. Remove the metal parts before applying the coating. 0.2 mm to 0.5 mm metal wire can be used for the strings. 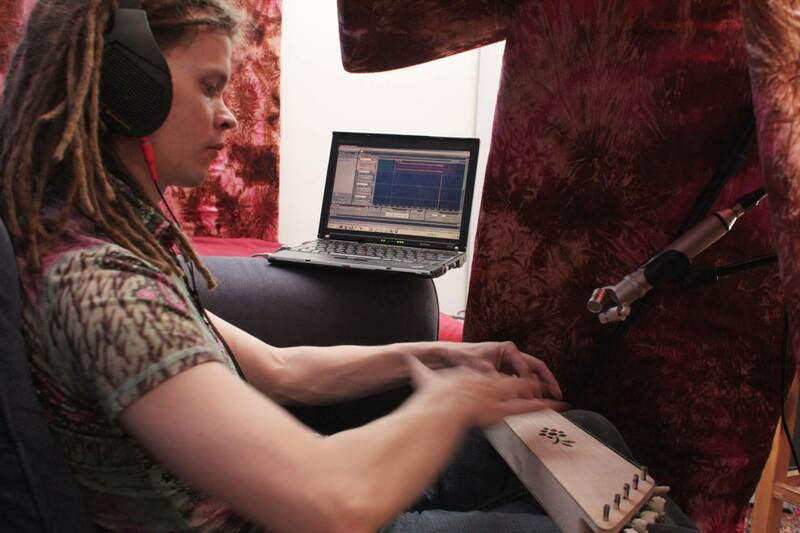 For this kantele, because the string lengths are not that different, I would recommend a succession of different thicknesses between those values, to increase the attainable frequency range. My opinion is, tune your kantele in any way that pleases you. It is quite a meditative instrument that you can also play just for your own pleasure. Just keep the notes in order, with the lowest one starting at the longest string. Note that the glue needs a couple of days before the tone of the kantele matures. Playing the kantele. Note that I play it the wrong way, the long side should be to the audience. Thanks again, this was well thought out and helpful. 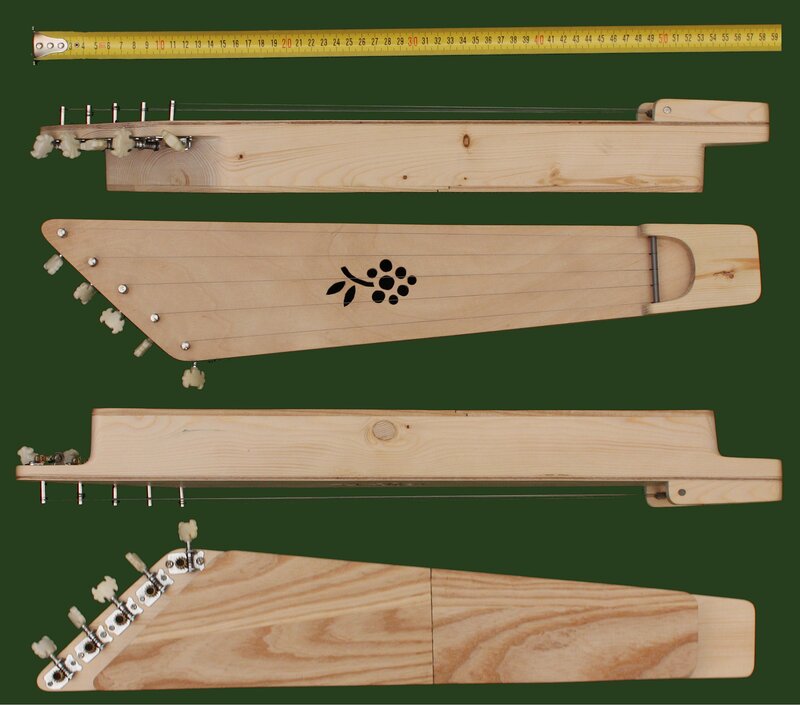 Thank you for your kantele construction article. Last year I saw it when browsing to see if any Finnish kanteles have machine head tuning. After reading it I decided to modify my existing 12 string instrument bought here in the UK on eBay and convert it to machine heads. One year on and I’m still really pleased with the result. It holds its tuning rock solid and was well worth the effort. I was researching 10th Century Northern navigation in my own roundabout manner. That got me to Finland (the Land of Wizards, according to the ancient Norse) and that got me to the Kalevala and that got me to Vainamoinen and that got me to the Kantele on Wikipedia and then I played your 1 minute and 32 seconds and….. fell in love. Yes, there ARE Wizards in Finland! Thanks very much for the instructions and pictures. From this, it appears that EVEN I might be able to make one. Certainly, I WILL try. Hope you still visit this site. Thank you very much for your instructions! I’ve made a kantele according to them, but when I put on the strings and tuned them, it appeared that when I dump a string with a finger of one hand and try to pick it with a finger of other hand, it just mutes the string instead of playing a different note. Is that my failure in construction or I just don’t pick sounds correctly? Hope you will see and answer me :) kiitos paljon! congratulations on your kantele build! Sorry that this answer comes a bit late, but that’s the way it works… you can’t change the note, so you only have 5 different notes available. Pressing a finger onto a string only mutes its sound. However if you dampen the string exactly at its center, you should get a nice 2nd harmonic overtone.